Your path will lead you from the stables into gently rolling fields of hay, from there it winds it’s way through a hole in the wall of trees and up into a forest of towering old oaks, maples, beech, pine, and cedar. As your path climbs through the forest keep your eyes peeled and wits about you – its not uncommon to see some of the wild residents of Glen Oro, such as deer, coyotes, rabbits, foxes, turkeys, and occasionally even the odd bear. Not to mention all of the smaller forest creatures! The sound of birdsong echoes through the trees, leading you up and up until you emerge into at an incredible vista. 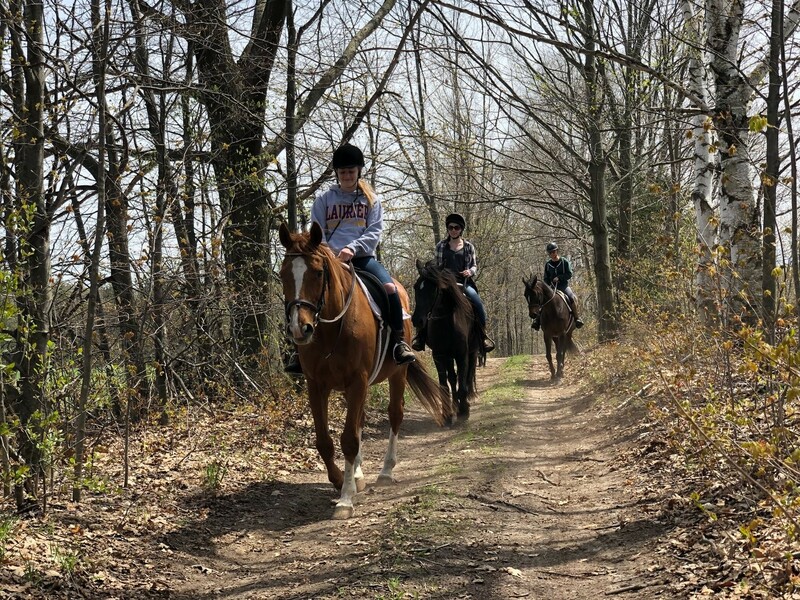 Our trail rides focus on creating a connection between you and your horse, emphasizing the incredible relationship between horse and rider as you move through the entire process of riding a horse – including the foundations of grooming, saddling, rider’s safety orientation, and grazing after your ride. We aim to leave our guests at Glen Oro with not only a really cool experience, but also the knowledge of a skill that has been handed down over thousands of years. Doesn’t everyone want to say they could ride off into the sunset, if they had to?